Fitting your operatory with high quality dental displays is essential to running a successful practice. Keep reading below to learn about the 5 essential dental monitor benefits. Are you at risk if you can’t see images clearly? A high luminance level can help you see X-rays more clearly and accurately. While a regular consumer monitor has a lumen level of only 250-300 cd/m2, DENclarity dental monitor has a lumen level of 440 cd/m2. This makes a difference when distinguishing the fine differences in grayscale, and can help you make more accurate diagnosis. How do you clean the screen surface of a monitor? Moisture and blood are always present in the operatory, making it vital to disinfect the monitor screen.However, most consumer monitors today do not have a water-sealed screen. This leaves them prone to bacteria build-up, and the screen’s edge getting yellowish from moisture trapped underneath it. At Exorvision, we designed the DENclarity dental monitor to be fitted with a water-sealed screen. This custom-design dental monitor allows you to spray disinfectant directly on the monitor screen – keeping your clients safe from harmful germs and bacteria and promoting a hygienic environment. Did you know a ‘Patient Care Area’ needs a low voltage monitor? In order to ensure your patients’ safety, it’s important to meet electrical code regulations in the dental operatory Patient Care Area (PCA). 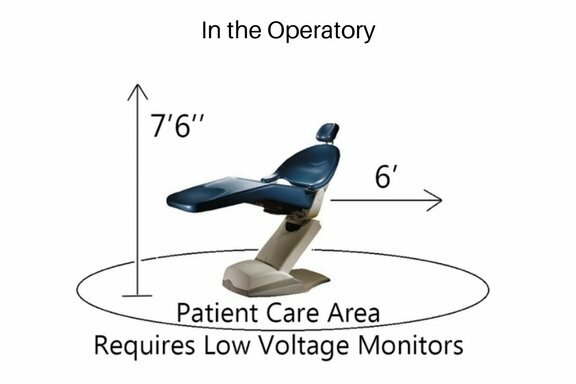 The PCA is defined as 6’ around the chair, and 7’6’’ above the floor – an area which often includes most practices’ dental monitors. Electrical code regulations state that monitors should comply with a low voltage level (DENclarity has 19 low volts). Many consumer monitors installed in operatories today have 120-volt power. Not only do those monitors not comply with electrical codes, they also pose a safety risk to patients and dentists alike. 120-volt monitors should be replaced with a low voltage monitor like DENclarity. How do you reduce patient anxiety? The most cited reason for a patient’s anxiety and/or stress associated with their dental visit, is fear of pain. In order to avoid the unpleasant feeling of pain, many patients delay or neglect to schedule regular checkups. An easy and effective way to reduce patients’ anxiety is showing them clips from a video or TV series. By shifting their attention to the TV, the patient is able to relax and feel more comfortable. This enhances the patients’ positive experience. Have you tried this seamless flow before? Many operatories have two monitors. A remote control allows you to make seamless transitions between X-rays, patient charts, and treatment plans between both monitors. If a patient is watching TV on one of the monitors, the remote control also enables you to quickly switch their view back to information regarding their dental visit. Being able to easily show patients their X-rays, charts, and treatment plan will often result in a higher treatment acceptance rate.